Invest in a great paddle. I don't care if you paddle Greenland style, or Euro. If you like carbon or wood. This is your connection to the water, make it a good one. I like my paddles light, so for me it is carbon, I also don't like bent shaft paddles. I use the Werner Kalliste (carbon/carbon) and I think it is about the best paddle ever made - I would like to try a Werner Camano, I have a very old one, and would love to try it out again. It may be my next paddle. I see too many people who end up spending more than they thought they would on boat/rack/gear and skimp on their paddle. It is like buying a ferrari and putting cheap tires on it. I am headed to the beach, to shoot the last bit of video for the next book. There may be some relaxing as well. But I am really excited with the month of July. Without going crazy scrutinizing numbers I will point out the following information. the number one post in the history of this blog is no longer about going to the bathroom in the woods. In just under a month, this is now the most popular post in the history of this site, and I am super proud. It is also the fastest a post has shot to the top like that, though I do have the good people of reddit to thank. The growth of that one post has pushed my page view count higher than it has ever been for one month, and is actually three times what it was last July. July will also have the highest number of posts of any month - in part because of the '21 tips in 21 days' posts. So it has been a great month, and I am really looking forward to the fall with the planning of Expedition 2014. Finally, on August 5th I am starting a 21 day meditation challenge with a couple of friends. If you are interested in joining us, let me know. Know when to deviate from the plan! Yup! Just as important as having a plan and sticking to it, is knowing when the plan is flawed, and it is time to change. The weather didn't do what the weatherman said it would do? What a shock! Time to hug the coast instead of the bold crossing you were planning. What you need to learn is judgement, and judgement comes with experience. Have a plan and stick to it. Think about your route before getting on the water. Know when the tides are changing. Watch the weather, and plan accordingly. The reason it is important to stick to the plan is so the person you have left a float plan with knows where you will be and when you will be back. Let Someone Know. Simple. Do a float plan. Or send an email to a friend. Or a text. In todays hyper connected world there is no reason not to do this. In it's simplest form it can be telling them where you are going and when you will be back, and what to do if you don't check back at the appropriate time. 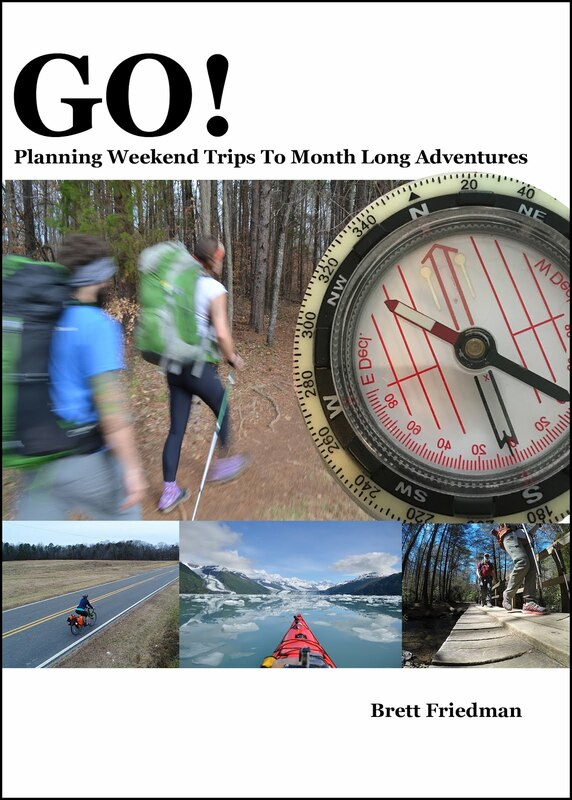 Here is a free download of a more extensive float plan I use on big trips. Choose your contact person wisely. You don't want someone who will forget you are out there! In prepping for expedition 2014 - which still doesn't have a name - I started as I always do by ordering a combination of charts and maps. The charts I order from NY Nautical. They are usually pretty good, but I had a few problems this time that I wont go into it. If you are a paddler and heading through New York City you must stop in there and buy a chart. Smitty knows his stuff incredibly well and it is an old world kind of place. So the last of my Charts trickled in over the course of two weeks. 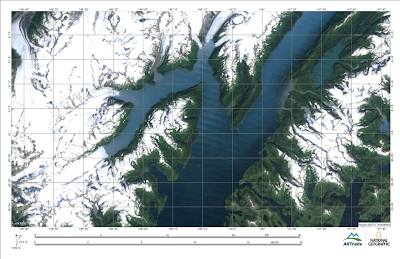 I also ordered from REI two trails illustrated charts of Prince William Sound. 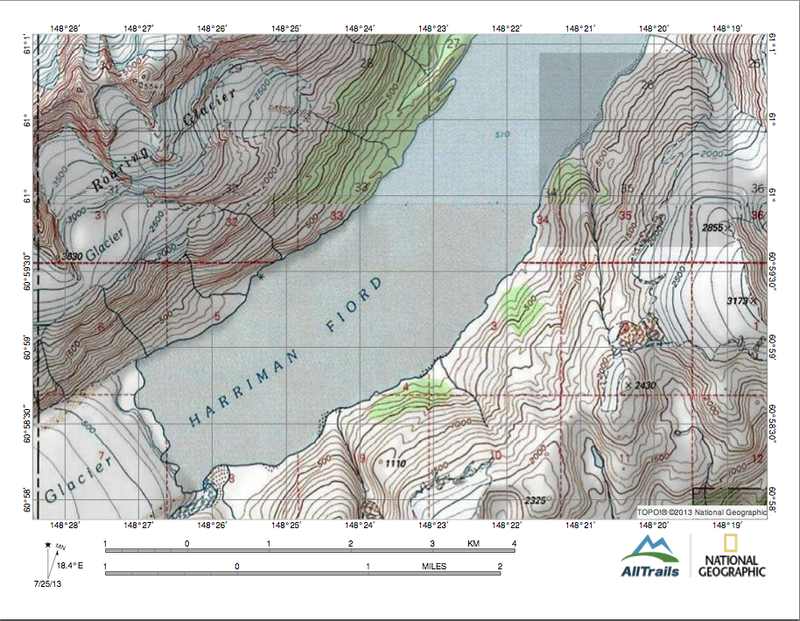 PWS west is topo map number 761, and east is 762. I already had a copy of 761 but it was pretty old, so I figured I would get a new one. It also had markings from a trip I did there in 2000. 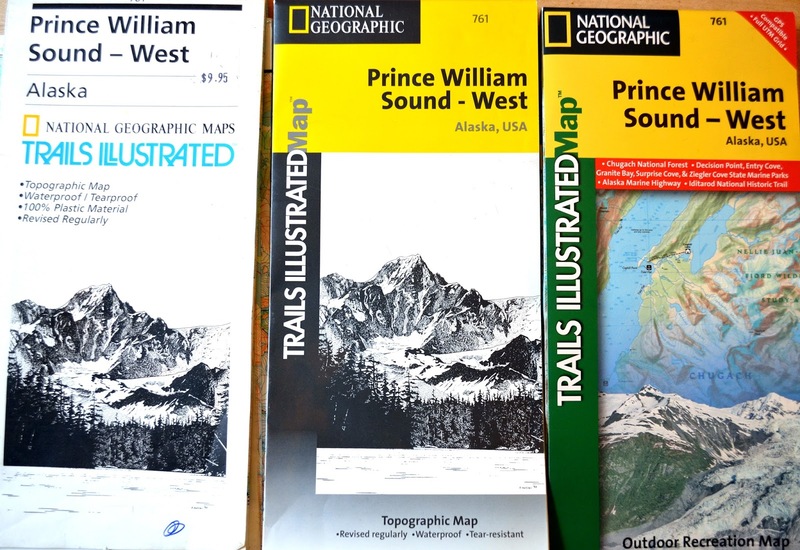 However, shortly after I ordered the two maps I realized that at some point I had bought a copy of map 761 - probably in 2008 when I was working for NOLS and paddling PWS. That meant I had three copies of the same map. I figured it was no big deal, I could probably sell or give one to another paddler in the group. But when the newest map arrived and I opened it up, I got a little surprised. Here are the three maps #761, left to right, oldest to newest. I really love Trails Illustrated maps. They are beautifully made, waterproof, and easy to work with on the deck of a kayak. But this is what surprised me. Here are three pictures of Harriman Fjord. Despite my lousy photography you should see that in each successive version of the map there better detail. While these maps are made for hikers, clearly someone at Trails Illustrated knows that they are being used by kayakers, as we went from dots to silhouettes of kayaks to illustrate landing sites. We go from contour lines, to contour lines with some shading, to a lot of shading. We also get a large amount of shading in the latest map, and even a growing number of depth information. 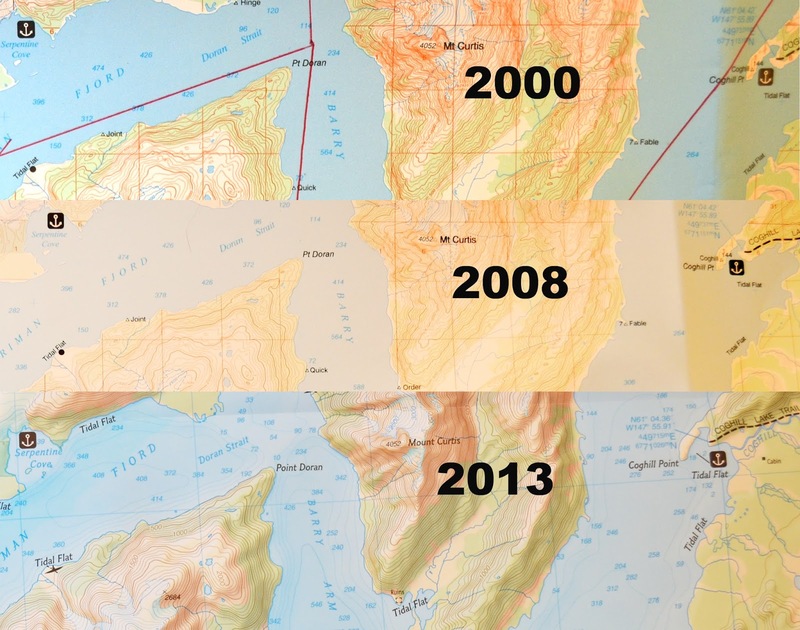 Clearly this is a good reason to update your maps! besides the fact that things like declination change, there are also updates to the details on these beautiful maps. Several months ago I also looked at the new trails illustrated online partnership with all trails. So, clearly if newer is better, these online versions must be the best, right? Unfortunately no. First it was hard to navigate to the right place on Alltrails.com. Because the maps are designed to be printed, I was easily able to make an 8.5 by 11 topo map in PDF form ready for printing. Here it is. While this is a great map ready to use - scale and declination on the bottom - it doesn't offer the detail or annotations of the paper maps. I would also have to print roughly 50 to cover the same info on the charts I ordered. So again, I am going to say that this online digital version isn't quite ready for prime time. But this is. 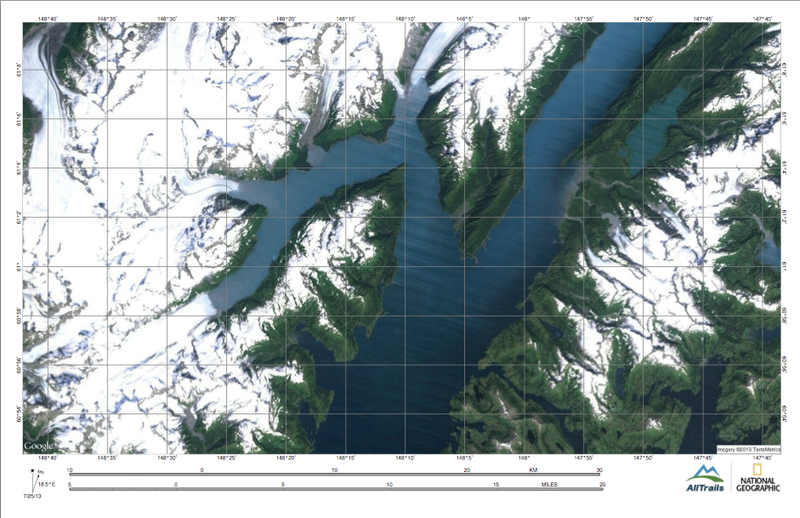 This is a satellite view of the same Harriman Fjord. Since we are going to see Glaciers, this view gives me a perfect view of where they currently - or at least when they picture was taken - lie in relation to the land. This is very useful, and I will undoubtedly print these out for many of our locations. Print them for reference while paddling. Always pack according to the Ten Essentials. Particularly if you are a new paddler. The Ten Essential Systems list should be followed. With all my experience on expeditions I have still been caught on day paddles without a first aid kit when I needed one. I could have easily made the entire 'Tip list' lines from the Ten essentials list, but I will only mention it directly this once. My version of the list for kayaking is here, if you don't like mine the REI list - though not paddling specific - is very good too. You think you know the forward stroke, keep practicing! I have been paddling seriously for 20 years, and I am still working on my forward stroke. I watch video of myself and scrutinize pictures. I watch other instructors to see how they are teaching it, and looking for how it relates to how I teach it, and how I paddle. Do you really think your forward stroke is perfect? I didn't think so. Keep practicing, and if possible find an instructor to help you. Dress for the environment. Which doesn't mean, you have to spend a lot of money on gear. My current favorite paddling jacket also happens to be the jacket I use hiking in the rain. I like eVent because it breaths really well, but you can use Gore tex or anything else you like. It also means synthetic base layers when needed. It may also mean A light colored UPF shirt. It means wear what is appropriate, and be prepared for the environment. Adapt accordingly. It also doesn't mean you have to dress for submersion. while I think this is safer, many people can't afford to dress for submersion. So if the water is 50º and you are going paddling - and you should, no one else is out, and the world is beautiful and quiet! - pack dry, warm clothes in a dry bag in case you get wet. Maybe even a stove for a hot drink! Paddle with loose fingers. This is very simple, and most people don't realize it. Your hands should be loose around the paddle. This will keep you from getting blisters, keep you relaxed and fluid. It also forces you to push the paddle. With a tight grip it is much more likely you will pull the paddle back through the water. On each stroke, think about the wind flowing through the open fingers on the hand that is in the air. I am not exaggerating when I say I have had yoga instructors give me a hard time over how flexible I am. I can sit in full lotus on the back deck of my kayak. Dubside was impressed with my flexibility when I met him at the East Coast Kayak festival a few years ago. I am not mentioning this to brag, I am mentioning this to add weight to the next sentence. I can't reach that back day hatch! I can usually get the lid off, and can occasionally get something out of it. But there is no way I can get the cover back on. But you know what? That isn't my biggest problem with the aft day hatch. My biggest problem is that a rear day hatch almost always adds an additional bulkhead - which does add nice rigidity to the hull - but it cuts the largest storage space in the boat in half. Making it hard to pack something big like food bags or a tent. They also generally have a pretty small hatch cover making it even harder to get things in there. For instance, The photo above is a Wilderness Systems Tempest 170 Pro. There is no way to get a normal sized pot in that hatch. You have to fill it with a lot of little stuff. Stuff I would normally pack around big stuff in my main compartment. Which means I am wasting space. Space that boat doesn't have to spare. Despite my disdain for the rear day hatch - which is on just about every modern touring kayak - I wouldn't NOT buy a kayak because of it, I would just make it a bit more specialized. If I owned a kayak with a rear day hatch I would do one of two things with it. I would create a bag system for food that would make it possible to pack it to the brim. 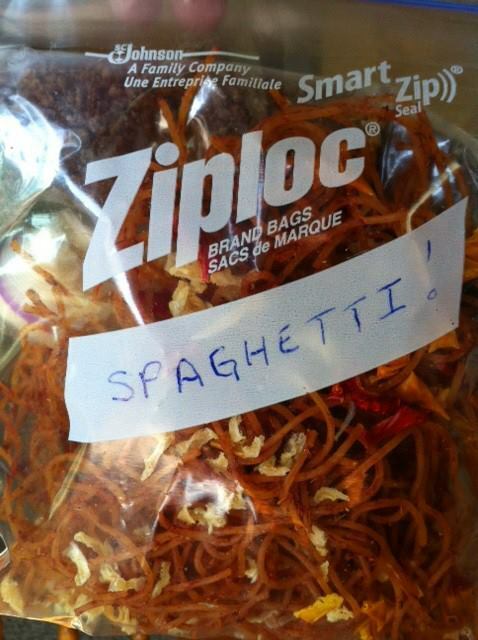 Solely for food, I think it would work well. My other option is to line it with spray foam insulation to turn it into a cooler - specifically for things like cheese and freshies (fresh vegetables that I normally pack on trips, onions, potatoes, carrots, peppers, cabbage, etc). This would take a problem and turn it into an asset. Before writing this I did a google search, and found several discussions on kayaking forums that there are people who swear by their rear day hatch. I am glad that they find the feature useful. If however, you are like me, and find the rear day hatch a useless waste of space and valuable resources, then remember that you are not alone. Shortly after paddling the inside passage I told my wife I was done with expeditions. I was still getting over the flu. I was exhausted. My brain was done. She looked at me and said 'we'll see.' She was right It was a little over six months before I started planning again, and honestly I came up with the idea about a month after I was back from Alaska. I didn't want to do as long of a drive, so maybe there was something on the east coast I could do. Looking at a map, the Northern tip of Labrador looks inviting, and it is a brand new Canadian National park. Unfortunately there is no way to get a kayak up to the park. But further south is a little town called Happy valley - goose bay. And there is a ferry that leaves Happy Valley and heads north to Nain, about 400 miles. Perfect. I started the planning in a communication black out. I didn't post where I was planning on going on any social media. 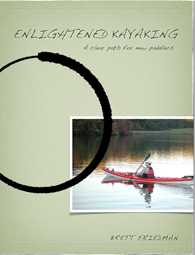 I reached out to a handful of paddlers - including my two biggest mentors - for information. I started planning. Charts went up on the wall, a route was decided on, and I worked on it for over a year. 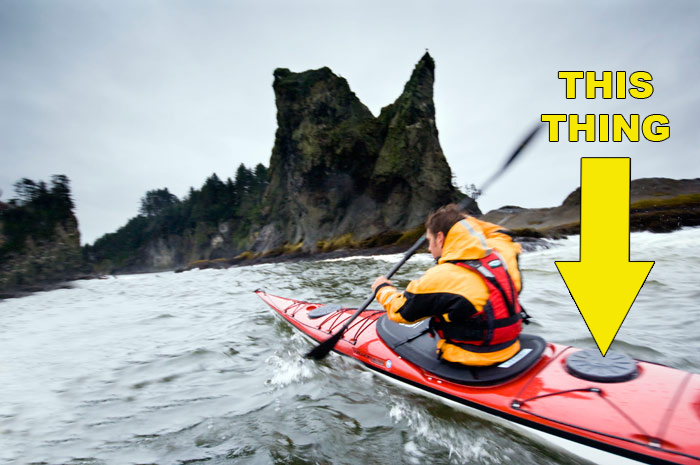 It is a stretch of coast that very few people have paddled. I love the planning aspects of expeditions. I have been doing it since I was 18 and I have gotten quite good at it. Part of it comes from planning trips, but a big part of it comes from working in the film and photography industry. Working in film, you have to think about goals, all the gear required to make the goals happen. The crews to operate the gear. Then you have to get all the gear to and from where ever you are shooting. In 1995 I worked on this advertisement for a perfume. 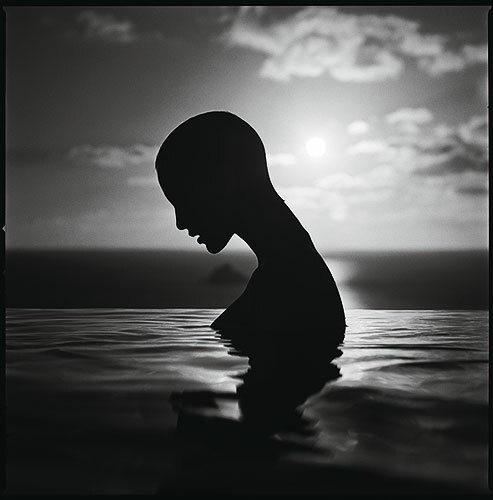 This was shot in St. Barthelemy in Patrick Demarchelier's swimming pool. St. Barths airport is too small to fly in all the gear needed for the shoot so gear came by boat, while crews came by plane from three continents. I was part of the production team that got all the gear and people where they needed to be, on time, through customs. Then we had to get it all out. I personally carried 30 or so cans of motion picture film on a small plane to Miami where I cleared customs. Film cans can't be opened - except in a dark room - and can't be x-rayed. Think about how much fun it is to get something like that through customs. What this work taught me is that just about anything can be accomplished given enough time and money, and that has translated well to expedition planning. Unfortunately what killed the Labrador trip wasn't money, it was time. The charts are rolled and in a closet. The trip isn't dead, it is just sleeping, until the right moment arrives, and the time hurdle can be leaped. It took me less than a week to not only come up with a new idea - I vowed to a couple of people that were interested in the Labrador trip that I was - without fail - doing a trip during the summer of 2014 - but to sell the idea to a couple of other paddlers. It isn't as 'epic' as Labrador. People paddle there pretty frequently. But we are going with a mission. A task to perform. What are the task, and that mission? You will have to stick around to find out.... When I went to Toronto I promised on Facebook that I had "big news, medium sized news and couple of things no one will really care about." It should just be a couple of days more. This past week I had the pleasure of visiting my countries delightful neighbor to the north. This was a very unofficial trip, I brought no paddling gear, not even clothes to paddle in. It was just a week in Toronto. But while I was there, the Otaku in me had to come out. 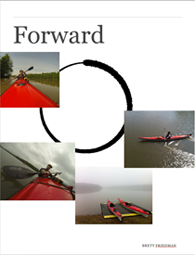 I made an effort to get a feel for the paddling community in Toronto, and I was very impressed. 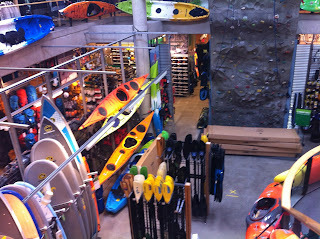 My first stop was MEC, or The Mountain Equipment Co-op. 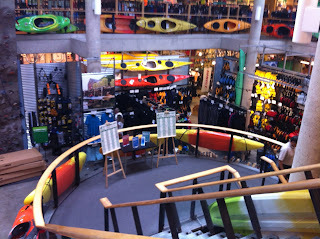 I was very impressed with the paddling equipment selection in this smallish - compared to REI and other US outdoor retailers - store. They had more cold weather paddling clothing than I have ever seen in one place, and that includes dry suits. I know a number of people - myself included - who have ordered drysuits online with fingers crossed because you are spending a lot of money on a piece of gear you can't try on. I also was able to try on the Kokatat Ronin Pro pfd which has been in the running as a potential replacement for my aging Astral 300r. Speaking of Astral, they were nowhere to be found. I was very surprised to see my favorite brand, a brand widely regarded in the US, not to be available. A quick look at the MEC website shows the only PFD's carried are Kokatat and MEC brand. Though they do carry the Astral Brewer shoe. Go figure. Another of my favorite brands that is missing from the MEC lineup was Werner. I think paddles was the area that the store - and website - were the most lacking. They had a very small range of kayaking paddles, mostly from the brand Accent, which I haven't heard of or used - though they may be very good! - I did see a lot of canoe paddles and SUP paddles, neither of which is surprising. I was very excited to see a great range on kayaks, from simple recreation boats to a good selection of 15 foot and bigger touring kayaks. As you can see in the photos, there are kayaks all over the store. If you follow me on facebook, you saw that I got a new throw bag to replace the one that was sacrificed to the bear* gods in Alaska. My next stop was to a spot along the Harbour front. 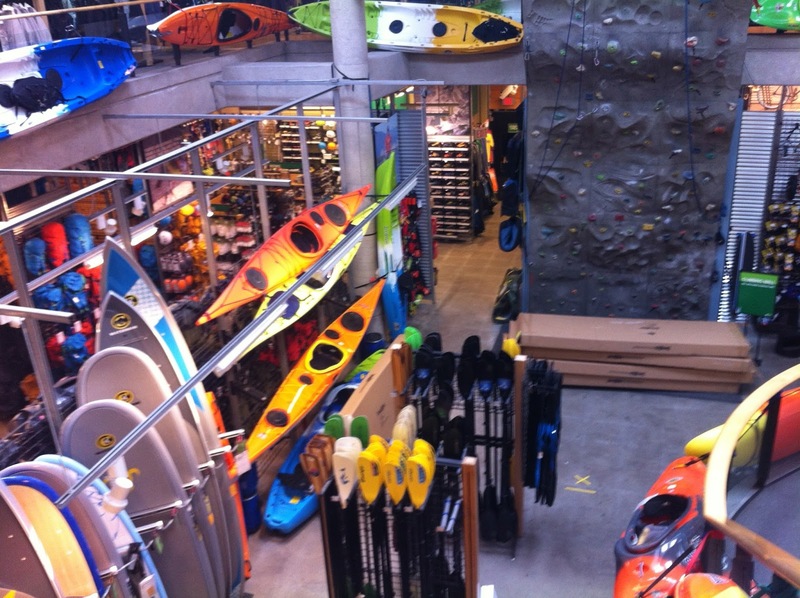 Paddle Toronto offers instruction in SUP and Kayak and also offered boat storage. Which is where all these nice photos came from. I met a lovely woman who happened to be paddling my boat, she told me that a boat can be stored at the harbour for around $400 a year, which is really quite reasonable. After visiting Paddle Toronto I decided to look into Paddle Canada which is their version of the ACA. But I have to say, from everything I read I liked the Paddle Canada curriculum and system a lot more. It looked like a simple progression up the skills ladder. To me it felt very similar to BCU, which I also prefer to ACA. All in all I was really excited by the paddling community in Toronto. I hope someday to be able to do some paddling up there. *I don't think I mentioned it in the version of 'The bear' posted here, but it did get mentioned in the version posted at Lets be Wild.com. The boats were tied to a tree with my throw bag. The tree was in the forest, a few feet from where the bear retreated too. I cut the line, so I didn't have to go in after it.